In preparation for the Mercedes-Benz Concourse event, a couple more pieces arrived in the mail to help get George ready for the show. 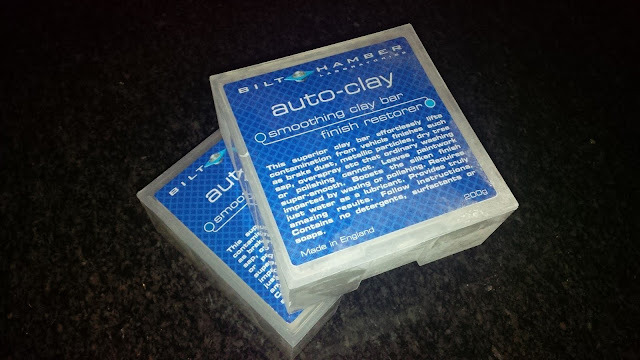 This time, I have bought a clay bar that will assist in decontaminating the paint work after washing. As with the Autoglym leather products I bought earlier, this one is also British. I have used Bilt Hamber auto-clay before, but that was the medium grade and used on a heavily contaminated car that was parked outside. This one, for George, is the fine clay. Since George is always kept indoors and washed regularly, I didn't see the need for a harsher than required product. If it's insufficient, I still have half of the medium compound remaining. That won't be till we're closer to the event date in October.